For any technology to be effective in this connected age, it cannot be an island. The most effective and popular solutions hinge on their ability to thrive as a part of an ecosystem. From cellular carriers to telematics suppliers, from resellers to customer software developers, industry must work together to eliminate dead ends that can occur without interoperability and scalability. By 2021, machine-to-machine (M2M) devices will make up more than half of the 27.1 billion IoT and connected devices around the globe, in industries like construction, energy and automotive. M2M communication will be pivotal to creating an IoT ecosystem that goes beyond point solutions for single customers. It will provide industries with networked end-to-end solutions so utility companies can remotely monitor their energy harvesting and customer usage, municipalities can keep tabs on service vehicles, mobile workers and traffic flow, and construction companies can gain insights into onsite asset location and performance, as well as operator productivity. A recent report by McKinsey shows that the engineering and construction industry, in particular, is moving toward a more connected future, with many startups focusing on fleet and asset management software that will help monitor operator safety and manage equipment performance. But beyond simply understanding the status quo, construction needs a boost in productivity. While construction-related spending accounts for 13 percent of the world’s gross domestic product, its annual productivity growth has increased by only 1 percent in the last 20 years. The regions with the most value lost due to this gap are North American and European markets, which account for 63 percent of the $1.63 trillion lost to productivity. McKinsey projects construction companies that take actions like infusing technology and innovation into the field could help boost productivity by 50 to 60 percent. Through always-on device communication, businesses can drive down performance gaps by monitoring equipment use, tracking their assets in real time and staying ahead of equipment downtime through predictive maintenance. But for any of these solutions to work, they need interconnectivity. 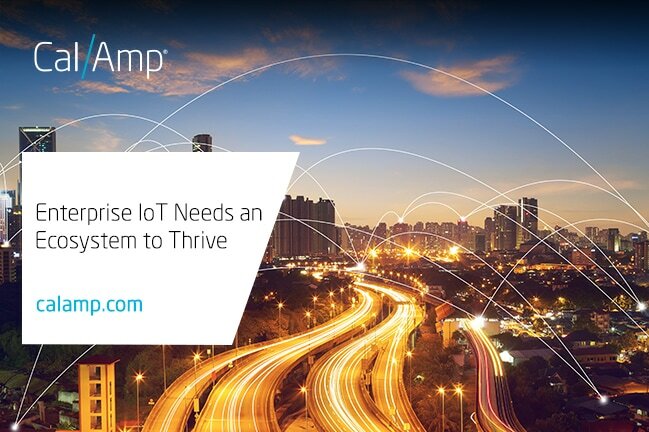 When enterprises have access to a reliable platform and greater insight into their assets and business processes, they can spend their time focused on the business problems IoT solutions solve. CalAmp enables these industries to realize productivity gains by leveraging our partnerships with mobile operators, distributors and software developers, together with our full stack telematics solutions. By tightly integrating their services with our smart devices, micro-services and CalAmp Telematics Cloud platform, we help businesses streamline processes and gain valuable insights to make more informed decisions. When a connected solution is comprehensive and highly interoperable with multiple solutions, it can help with every part of how an enterprise handles its data, from delivery to storage to analytics. Creating a global ecosystem of connected assets is the path forward so enterprises can thrive.